If you have lived your life directed by external elements (externally referenced) rather than complying with your natural addictive drives internally (internally referenced) you will have less consistent patterns and fewer of them to help develop formulas for the future. 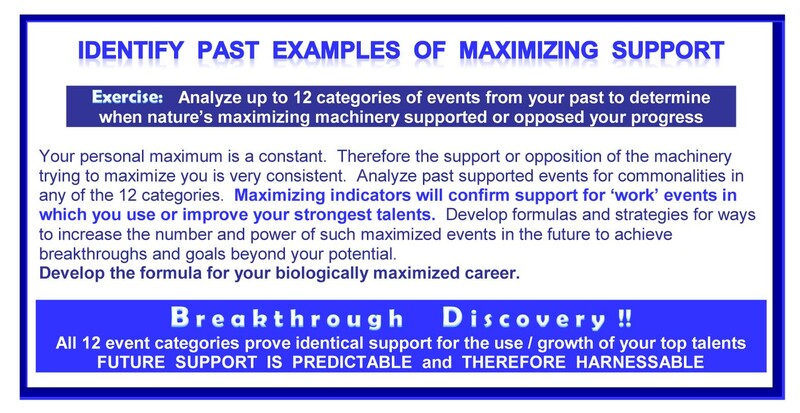 What do you do if you cannot see any past patterns or themes of events for any of these twelve categories? What if you see no evidence of past partnering with the evolutionary machinery? What if you find no evidence of operating your complete internal-external system? Not to worry. This is fixable. Sometimes people must or choose to live externally referenced and created by their realities rather than internally referenced and creating their realities. They have been living their lives responding to the unnatural demands of others or their environments. There could be financial, cultural, religious, familial, or physical demands that have made them overrule their internal addictive drives. They may have chosen to discipline themselves to follow some formula for success they believe in. They may have been overruling those internal guidance systems to serve external rules. In short, they may have ignored or overruled the natural drives to which we now want each of you to respond. As a result, they may not have enough examples of having partnered with the evolutionary machinery from which to determine formulas for harnessing its capabilities for future goals. They may have less consistent patterns or fewer of them from which to deduce themes or commonalities. They may have fewer experiences of clusters of coincidences and the other facilitating elements of the maximizing machinery. The more you comply with the maximizing flow going forward, the more patterns you will see. As soon as you begin partnering with the maximizing machinery as prescribed, the clusters of coincidences and flow events will emerge and you will have the models you need for future reference. Everyone is going to be testing their hypotheses as to formulas for harnessing the flow on an ongoing basis. You can do the same. Everyone will make corrections as needed based on the response of the maximizing machinery. You will do the same until you can get predictable support from the machinery to achieve your goals more quickly, easily, and expansively. Be patient with the process. Just as those addictive drives associated with our top talents strengthen every time you use them, they also atrophy every time you overrule them. It may take a few trials in order to kick-start your addictive drives again.